Today was Emmett's shot of Adequan for the bum hips. Nate wasn't here to give it to him. This mean I was dealing with the needle (we're doing the shots at home, hello money saver!). Emmett is fine and sleeping...I just finally pulled my self out of the fetal position and am starting to function normally. Yes I am a big baby and yes I hate needles even if they aren't going into my body (lets just say I'm not a blood donor). Good thing I love this fuzzy little joy of a dog and that this stuff is working amazingly for him. 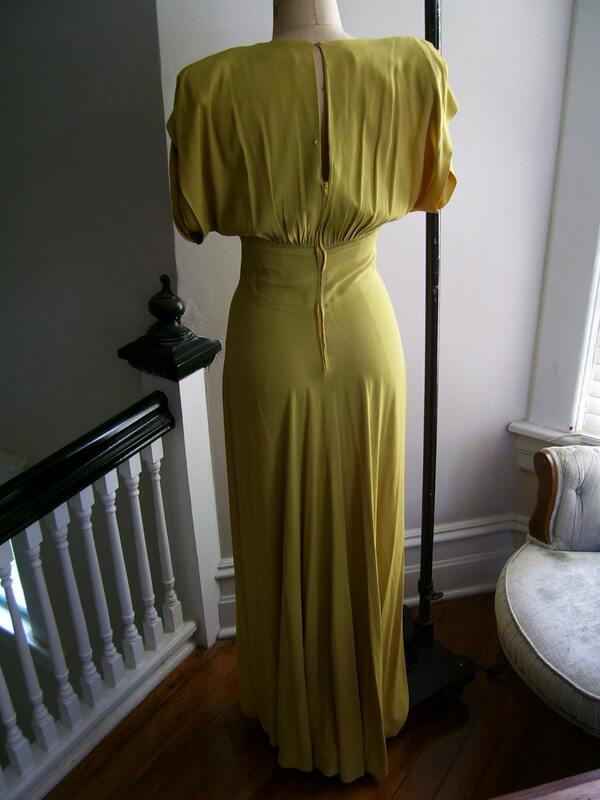 Seeing as I just dealt with a needle like a somewhat mature person (hey you didn't have to hear me squeal) and I am still pissed at my Mii, I figured today was a good day to post about another vintage dress beauty. I know a lot of you have been waiting for this one, because I did a teaser picture of it. 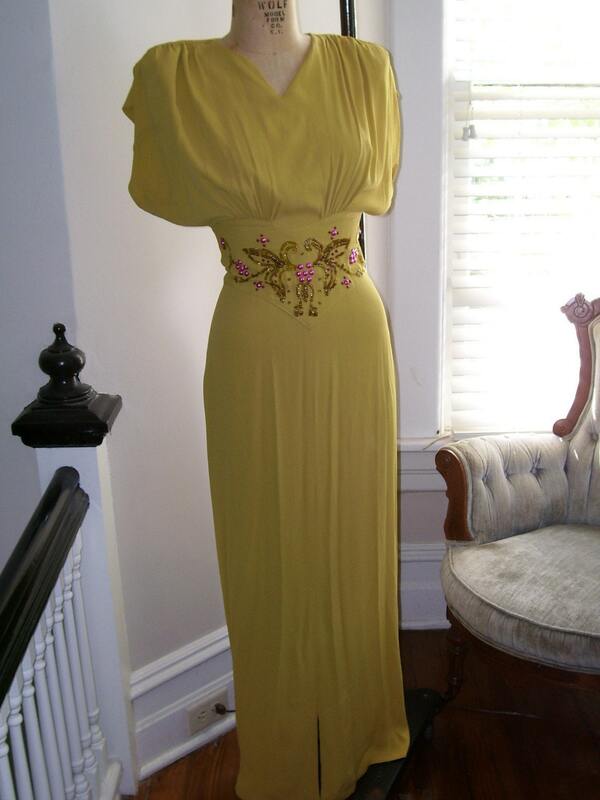 This beautiful dress is pure 1930's/1940's and the color is unlike any other that I have ever seen. The waist on this dress is incredibly tiny, as in I just barely got it zipped up Miss Betty. Part of me wants to say that the zipper was replaced, which really isn't too shocking. If it was replaced they did a damn good job finding a excellent color match (thus why I'm not 100% it's new). I really love everything about this dress, from the simple beading to the over the top shoulder pads. Hopefully that will hold everyone over till I can get to another dress! Oh and by the way, eating better right after Girl Scout cookie season is awful. I wanted to drown my needle sadness in some Thin Mints. The boxes are mocking me. I LOVE that dress. Love. It. Of course I would never have anywhere to wear a dress like that, but I think that OWNING a dress like that could make one happy, all by itself! That detail work is just stunning! GAAAH! This is breathtaking. I LOVE it!!!! Love, love, love that one! If I were closer I'd come break in your house and steal it. @Funky: I pretty much own it because it makes me happy. @Laddie: I know where you live...ish! That is stunning! Are you able to wear this dress? Or does that go against vintage collecting. I'm clueless. I only collect dust. I really, really love this dress. One of my favorites from your collection. I wouldn't care if I never found a place to wear it, I'd just love having it. I totally love that dress! It is so me! @Valerie: You can wear vintage as long as it's in good shape. There are certain clothing that some might think you'd be crazy to wear, but I say do what makes you happy! @Cassie: I'm tempted to take you up on that offer! @The Redhead Riter: It really does just call out to be loved doesn't it?